In spite of the well-defined phenotype, Sotos syndrome is frequently difficult to diagnose particularly for the inexperienced clinician. Considerable overlap with other ill-defined overgrowth phenotypes exists, further complicating the situation. 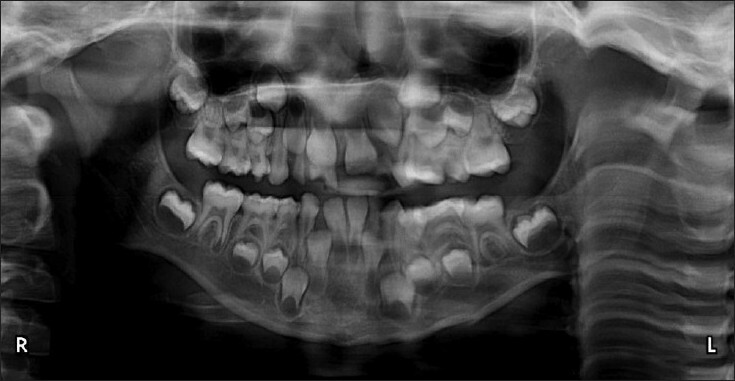 This paper documents a 5½ year-old female child diagnosed with Sotos syndrome and describes the primary clinical features, the disease-specific craniofacial, oral and dental findings, and the required dental care management for this patient. 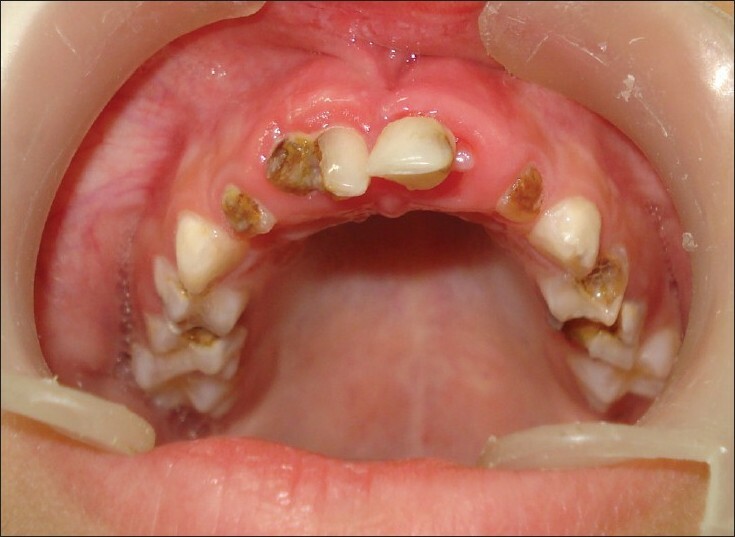 A 5½ year old female child reported to the Department of Pediatric and Preventive Dentistry, Faculty of Dentistry, Jamia Millia Islamia, New Delhi, with the chief complaint of multiple decayed teeth. 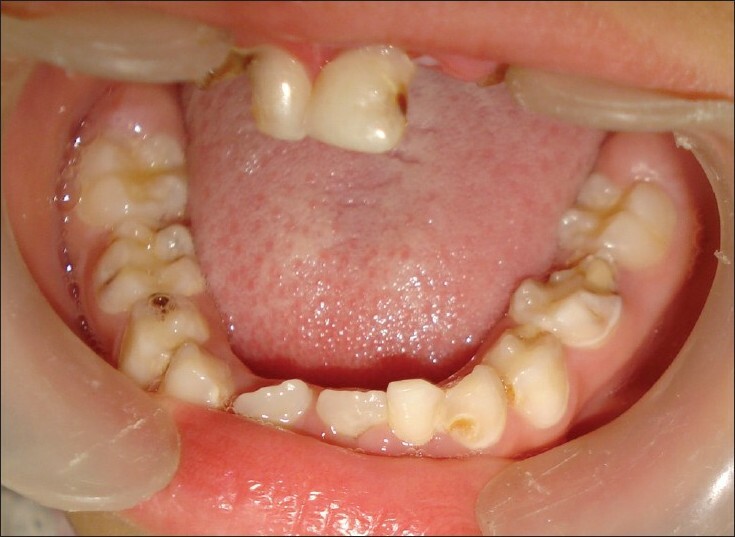 The child was asymptomatic and the only concern was progressive fracturing of the teeth. Physically the child appeared ahead of her chronological age, whereas mentally the milestones appeared to be delayed. Medical history when elicited revealed that the patient was the first child of her parents, with a birth weight of 3.7 kg and head circumference of 37 cm. Though the parents could not remember the height of the child at that time, it was higher than normal. At the age of 7½ months, her weight had increased to 8.25 kg with height of 79 cm and head circumference measuring 47 cm. Wrist radiographs taken at the age of 5 months revealed advanced bone age by 1-1½ years. Milestones like walking, speech, etc. were delayed. Bed wetting was present till the day of presentation. Parents also revealed that the patient had constant episodes of constipation and used to suffer regularly from common cold. Also, the patient had poor concentration abilities and used to get agitated very fast. However, socio-adaptive skills were more delayed than motor skills. Stanford Binet test revealed an IQ of 75-80 with borderline intelligence. Karyotyping revealed 46XX genome with no abnormality detected. Chromosomal typing also did not reveal any abnormality. 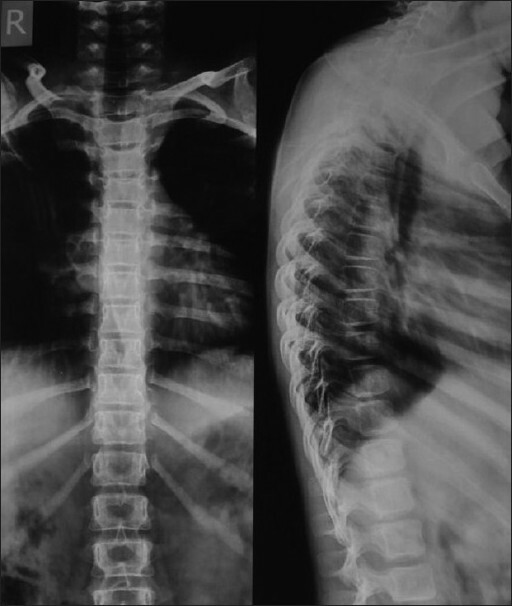 X-ray spine revealed development of mild scoliosis for which physiotherapy was immediately advised [Figure 1]. General and extraoral examination revealed face with disproportionate prominence of forehead, pointed chin, macrodolichocephaly, receding hairline, apparent hypertelorism with downslanting palpebral fissures, prominent jaw, malar flushing, mild micrognathia, and large ears [Figure 2] and [Figure 3]. Intraoral and radiographic examination revealed high arched palate and very high caries activity with carious involvement of 51, 52, 54, 55, 61, 62, 64, 65, 73, 74, 75, 83, 84, 85 and deft score of 14. 16, 26, 36, 46, 31, 41 were in the eruptive phase [Figure 4],[Figure 5],[Figure 6]. For 40 years, the diagnosis of Sotos syndrome has been based on the subjective evaluation of clinical features. Recently, Tatton-Brown and Rahman analyzed he clinical features of a large series of more that 200 Sotos syndrome cases with proven abnormalities in NSD1. Generally, pregnancy is described as normal; however, toxemia or pre-eclampsia is mentioned in several cases. In our case, birth asphyxia was considered as the probable etiological factor. Mean gestational age is normal (39 weeks) in these children, but the infants are large for their gestational age. According to Cole and Hughes, birth length, weight, and occipitofrontal circumference (OFC) are, respectively, 3.2, 1.0, and 1.8 standard deviations above the mean. In the neonatal period, many infants experience early feeding difficulties (40% required tube feeding), variable degree of congenital hypotonia, jaundice by hyperbilirubinemia or hypoglycemia. Throughout childhood, growth is particularly pronounced in the first year of life, after which it stabilizes with a height consistently above the 97th centile between the age of 2 and 6 years. Growth in height and weight tends to normalize at puberty, probably because of the epiphyseal fusion. Final height is, in the majority of cases, within the high normal range,  particularly in females, in whom the growth pattern correlates well with the presence of advanced bone age and early puberty. Macrocephaly and large hands and feet are also consistent features. The overall craniofacial features are distinctive, especially between 1 and 6 years of age. In infancy, the face is round with disproportionate prominence of forehead and becomes longer in adolescence, with prominence of the pointed chin. Macrodolichocephaly, receding hairline, apparent hypertelorism with downslanting palpebral fissures, prominent jaw, malar flushing, anteverted nostrils, mild micrognathia, high arched palate and large ears are commonly identified. The overall craniofacial features were similar in the present case. Most patients have a non-progressive neurological dysfunction manifested by clumsiness and poor coordination. Cole and Hughes  reported a mean developmental/intelligence quotient (DQ/IQ) of 78 Sotos cases with a range 40-129 (n = 23), and recently, de Boer et al. found that the mean IQ in 21 individuals with NSD1 gene alterations was 76 (range 47-105). Delay in expressive language and motor development during the infancy is particularly common. The degree of learning disability appears extremely variable. Delay in walking until after 15 months of age and speech delay until after 2.5 years are usual. Attention deficit and placid behavior may also be a component. Variable degrees of scoliosis are present in 30% of the NSD1-positive cases. 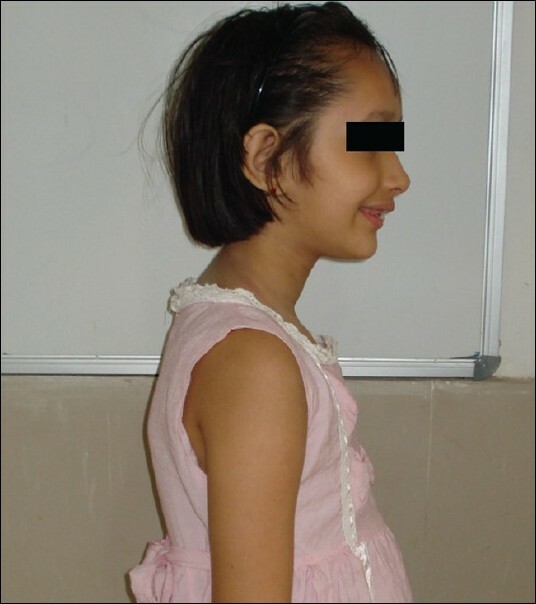 Development of scoliosis was seen in the present case for which physiotherapy was advised. Overgrowth syndromes are often associated with neoplasms ( Beckwith-Wiedemann syndrome More Details with overexpression of IGF-2 and Simpson-Golabi-Behmel with GPC3 mutations). Initial reports suggested a neoplasm frequency of 7% in Sotos patients. No biochemical or endocrinological markers have been documented in patients with Sotos syndrome and/or NSD1 aberrations, especially in endocrine and paracrine systems. In such patients, comprehensive treatment, ranging from initial preventive measures to more definitive treatment of restorations and extractions along with complete guidance and motivation of parents to maintain oral hygiene and visit dental surgeon for regular and timely dental checkup is required. The purpose of this case report was to review the diagnostic characteristics of Sotos syndrome. Due to its rarity, many of the particularities of Sotos syndrome remain unknown. Close family and professional supervision are required to ensure that Sotos syndrome patients receive appropriate dental treatment. 1. Sotos syndrome. Geneviève Baujat and Valérie Cormier-Daire,.Orphanet J Rare Dis 2007;2:36. 2. Cole TR, Hughes HE. Sotos syndrome: a study of the diagnosticcriteria and natural history. J Med Genet 1994;31:20-32. 3. Kurotaki N, Imaizumi K, Harada N, Masuno M, Kondoh T, Nagai T, et al. Haploinsufficiency of NSD1 causes Sotos syndrome. Nat Genet 2002;30:365-6. 4. Douglas J, Coleman K, Tatton-Brown K, Hughes HE, Temple IK, Cole TR, et al. Childhood Overgrowth Collaboration: Evaluation of NSD2 and NSD3 in overgrowth syndromes. Eur J Hum Genet 2005;13:150-3. 5. Opitz J, Weaver D, Reynolds J. The syndromes of Sotos and Weaver: Reports and Review. Am J Med Genet 1998;179:294-304. 6. Agwu JC, Shaw NJ, Kirk J, Chapman S, Ravine D, Cole TR. Growth in Sotos syndrome. Arch Dis Child 1999;80:339-42. 7. Lapunzina P. Risk of tumorigenesis in overgrowth syndromes: a comprehensive review. Am J Med Genet C Semin Med Genet 2005;137:53-71. 8. Wit JM, Beemer FA, Barth PG, Oorthuys JW, Dijkstra PF, Van den Brande JL, et al. Cerebral gigantism (Sotos syndrome): compiled data on 22 cases. Eur J Pediatr 1985;144:131-40.